Power Steering Fluid has a yellow tint. 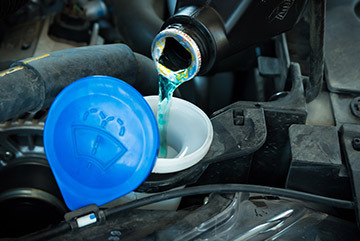 Windshield Washer Fluid can be any range of colors from bright blue, orange, pink, or yellow. It has the consistency of water and may smell somewhat sweet. Motor Oil can be bright or dark brown depending on how often you change it. Frequently changed motor oil will be light brown, while old motor oil will be a darker shade. You should have your motor oil changed every 3,000 – 5,000 miles.